Simply cover the scoop jaw with the dog’s waste bag and start picking up the waste. Can also be used for picking up any other unwanted waste. Includes one roll of disposable waste bags. BLACK - DOG/CAT PET CARRIER * Easy To Clean* Fashionable & Practical Design * Airline Approved * Shoulder Portable Bag * Travel Pad Is Removable For Easy Washing* Mesh Arround For Privacy & Breathability * Comfotable For Your Pet * Multiple Convenient Pockets * Padded Shoulder Straps * Incudes A Tether Inside * Pet Carrier Are A Stylish Solution For Pets And Pet Owners On The GONote: PLEASE MAKE SURE YOUR PET WILL BE COMFORTABLE IN THESE MESSUREMENTS: SMALL: 16in x 8in x 11.5in FREE Shipping is for lower 48 states ONLY. Hawaii and Alaska please email me for shipping quotes. Thanks for looking. DELUXE NYLON PET BARRIER. Can be used alone or the tubular barrier for extra security. Elastic cord and no-mar fittings keep the net in place. Don't let your dog be a nuisance while you drive, like being in the front seat with you! Choosing the right dog carrier will be a crucial factor in how well they travel. Not only does it allow your pet to gaze at its surrounding but it also lets you keep a close watch on your pet as well. 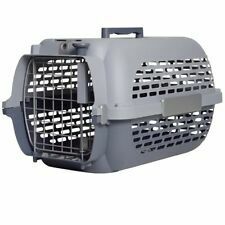 X-ZONE PET Pet Carrier for Dog and Cats, Airline Approved Soft-Sided Pet Travel Condition is New. Three entrances, easy to access. Unzip top entrance, pet can poke their head out. Easy to set up and fold down flat for storage. The quilted, incognito design allows for inconspicuous transport of your pet anywhere. Entirely machine washable. Product Overview. Machine washable. NEW wot "OVERLAND" Dog Gear Carry All Bag Save! NEW "OVERLAND" DOGGIE GEAR BAG. Separate zipper pocket on side. Has tabs on each end to add an over shoulder sling if you want. Carry all you pets needs for going off and traveling. Compare online at 38.99. 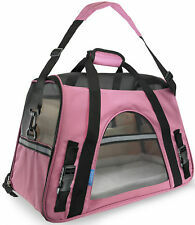 Expandable Soft Sided Airline Approved Pet Carrier with Padded Insert. Expandable Area for Comfort. FrontPets Expandable Pet Carrier Features Traveling through an airport can be scary for your pet, but our bag is designed to eliminate that fear by providing the ultimate comfort and built-in safety features to keep your pet calm and safe. Outward Hound DayPak Dog Backpack Adjustable Saddlebag Style Hiking Gear Med. Explore new ground with Outward Hound Gear! Our high-quality performance gear will keep your pup safely equipped for every new adventure! Sizing guidelines may differ dog to dog. And take any other unique traits (large shoulders, long torso, etc.) into consideration. Explore new ground with Outward Hound Gear! Our high-quality performance gear will keep your pup safely equipped for every new adventure! Reflective accents and vibrant colors enhance visibility. polyester backpack and carrier in one can be opened at the front and side with extra front pocket adjustable shoulder straps short leash prevents the pet from jumping out with net inserts for good air circulation flaps at the back to put a seat belt through bottom plate removable colour: black/blue T-Bag rucksack is suitable for pets weighing up to 8 kg . 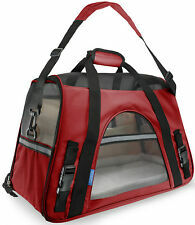 Suncast Portable Soft-Sided Folding Pet Carrier for Dogs Cats or Small Animals. The sides have full screen windows, like a tent, and they unzip for easy access. The interior is plushed out with a Sherpa cushion, making for a restful voyage. Easily rests through a suitcase's pull-up handle with the attached luggage sleeve. Divider to keep food carriers stacked neatly. The Overland Dog Gear features the following Organized luggage system makes it simple to travel with your dog up to a week away. 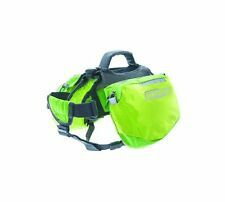 Multi-functional - Give your dog a job to do with this athletic looking saddle bag.Perfect for hiking, training, outdoor activity and service dog use. Material: Cotton Canvas. Structure: 2 main zipper pouch, 2 front pocket(One Side). Faux leather is soft and durable, it looks good and is easy to maintain. The Hog Bag can be carried by the comfortable, ergonomically designed carrying handle or, carry hands free with the included shoulder strap. PURPLE - DOG/CAT PET CARRIER * Easy To Clean* Fashionable & Practical Design * Airline Approved * Shoulder Portable Bag * Travel Pad Is Removable For Easy Washing* Mesh Arround For Privacy & Breathability * Comfotable For Your Pet * Multiple Convenient Pockets * Padded Shoulder Straps * Incudes A Tether Inside * Pet Carrier Are A Stylish Solution For Pets And Pet Owners On The GONote: PLEASE MAKE SURE YOUR PET WILL BE COMFORTABLE IN THESE MESSUREMENTS: SMALL: 16in x 8in x 11.5in. Feel it inconvenient to take your pet outdoors?. 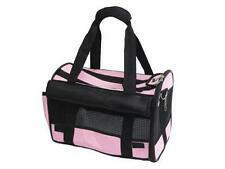 Lack of such a stylish and practical pet bag, you will never feel relaxed! It'll greatly save much labor when you are outdoors with your pet. 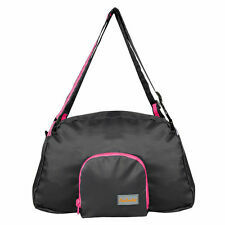 This bag can be used as a single-shoulder bag or a handbag for convenient carrying. OneTigris Dog Pack Hound Travel Camping Hiking Backpack Saddle Bag Rucksack for. Condition is New. Has original tags still. Shipped with USPS Priority Mail. Keep your pup safe and comfortable with the Outward Hound PoochPouch Front Carrier. Explore new ground with Outward Hound Gear! Our high-quality performance gear will keep your pup safely equipped for every new adventure! A Perfect and Comfortable Accessory in which to Carry Your Pup. 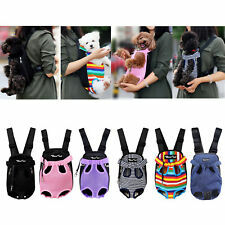 Unique Puppy Purse Carrier Harness. Pink, black, white plaid. This is like a. Size Small: 8" - 10" chest size. Poly Border Trim. Size Large: 11.5" to 14.5" chest size. polyester cover foam filling with 4 side pockets short leash prevents the pet from jumping out net insert and ventilation holes for good air circulation netting can be covered up to protect the pet inside with zipper in the front colour: dark blue/white/beige Size 22 × 26 × 41 cm, . 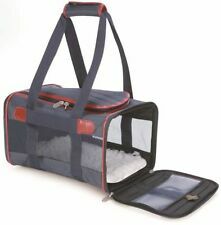 Airline Approved Two sides Expandable Pet Carrier by Pet Peppy - NEW - FAST!